Given I am an avid reader of her mostly but not entirely crime-fiction themed blog I feel a bit guilty that I haven’t read Patricia Abbott’s own fiction before. But the short story form for which she is so well known just doesn’t grab me (I buy collections of them, I’m just never tempted to actually read them). Paradoxically I love a short novel so CONCRETE ANGEL, which clocks in at just over 250 pages, sounded perfect. Its unsettling contents more than lived up to expectations. Although there are a lot of crimes depicted in CONCRETE ANGEL they are not the heart of the matter. No one is really interested in solving any of them, not even the murder with which the book opens. People are interested in covering them up though. In pretending they haven’t happened. Although for the perpetrator of most of the crimes – Eve Moran – this is all just part of the way she builds a story of her life that is the way she wants it rather than the way it is. Eve is a ‘never let the facts get in the way of a good yarn’ kind of gal. Those who are under the influence of whatever charms Eve possesses willingly play their part in such coverups. And even when they’ve grown tired of her manipulations a combination of lingering entanglement and desire for self preservation means Eve is rarely without assistance when it is most needed. The story starts in Philadelphia in the 1970’s. Eve shoots dead a man she brought home to the apartment she shares with her twelve year old daughter Christine. Within a few hours Christine has confessed to the shooting and accepted the mantle of child who kills and all that goes with it (though the ‘all’ is a lot milder than you might imagine). Before long Eve’s ‘memory’ is of the made up version of events rather than the reality and that pattern is repeated throughout the novel as we learn about Eve’s life both before and after this particular night. Eve was born just before the start of the second world war, described in Abbott’s imaginative prose as “descending on [her parents’] simple Lutheran lives in 1938 like a tsunami”. The reader gets the sense that Eve’s traits – her wilfulness, her narcissism and the almost primal need to acquire things – are not entirely the result of her strict upbringing. Even when things are going well for her – such as when she marries a soldier from a local well-to-do family – she can’t control her impulses. Or perhaps it is better to say she won’t control them. Why should she? Eve is hardly a likeable character but she certainly is compelling. I grew up at roughly the same time as Christine so the book’s period setting should feel vaguely familiar to me but it doesn’t. I don’t mean it doesn’t seem realistic, just not something that I recognise. I suspect it’s the gun thing. They are normalised in America in a way that still has the capacity to astound me. The fact that CONCRETE ANGEL opens with a scene in which a woman shoots a man six times with a weapon provided by her ex-husband ‘just in case’ she ever needs protection and that no one ever queries this puts the book into foreign territory for me in a way that something set in the remotest part of Iceland probably wouldn’t do. 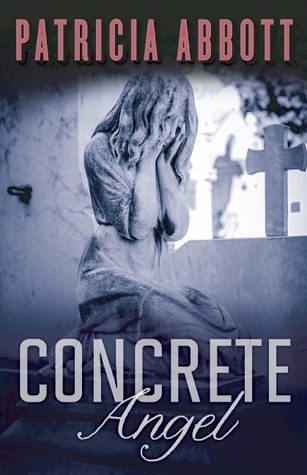 CONCRETE ANGEL is a slow-burn of a read that delves deep into the darker side of human psychology. Though not full of twists in the traditional sense for crime fiction there is genuine suspense in seeing the relationship between Eve and her daughter develop. I can’t be the only reader who spent a good portion of the book very, very worried for the child who desperately needed someone in her corner. This work by http://reactionstoreading.com is licensed under a Creative Commons Attribution-NonCommercial-ShareAlike 3.0 Unported License. This entry was posted in book review, Patricia Abbott, USA. Bookmark the permalink. So glad you liked this one, Bernadette. I thought it was a fantastic depiction what can happen in the parent/child relationship, and what can go so terribly wrong. I liked the psychological layers, too, as well as the actual plot. Very good review. Looking forward to reading this one. Thanks so much for this thoughtful review. I have such kind friends be them in the US or far from home. Very good review, Bernadette. I liked your last sentence: I can’t be the only reader who spent a good portion of the book very, very worried for the child who desperately needed someone in her corner. While I was reading Concrete Angel, I was disturbed that there was no one really in Christine’s corner, but the situation felt realistic and it made me sad. This is one the top books I have read this year. And yes, you are probably right about the gun thing in the US. In the South where I grew up, it would not be unusual at all. And even when I lived in Riverside California my first husband (also from Alabama) bought me a gun to keep in the bedroom because he was a pilot and gone for a week at a time. In my current household we do not and would never own a gun. We see so much American TV and so many movies that I am usually a bit immune to the gun thing Tracy but it really struck me here – it just would not have occurred in the city where I grew up in the 1970’s. Guns here are for cops or farmers. Even the criminals have a hard time getting them, let alone average parents having one in the drawer. All posts at http://reactionstoreading.com are licensed under a Creative Commons Attribution-NonCommercial-ShareAlike 3.0 Unported License.